Ví esta receita na Nigella ficou logo nas minhas favoritas. Eu adoro panados de frango mas detesto tudo o que tenha de ser frito, a casa fica toda a cheirar a óleo, eu fico a cheirar a óleo… mas estes panados são feitos no forno, por isso não só são mais saudáveis como não dão trabalho quase nenhum! I saw this recipe in nigella tv show and i want to make it immediately! The thing is: i love chicken nuggets but i hate anything deep-fried, the whole house gets smelly, my hair and clothes get smelly… anyway, these chicken nuggets are baked in the oven, so not only they are healthier but are also almost fuss free! Cortar o frango em pedaços pequenos e marinar no iogurte. Colocar no frigorifigo pelo menos durante 2 horas. Para triturar as bolachas basta coloca-las num saco de plástico e esmagar com um rolo da massa. Adicionei tomilho para dar mais sabor! Start by cuting the chicken small pieces and marinate them in the yogurt. Keep them in the refrigerator for at least 2 hours. To make the cracker crumbs just put them in a plastic bag and crush using a rolling pin. I added some dried thyme to flavour things a bit! 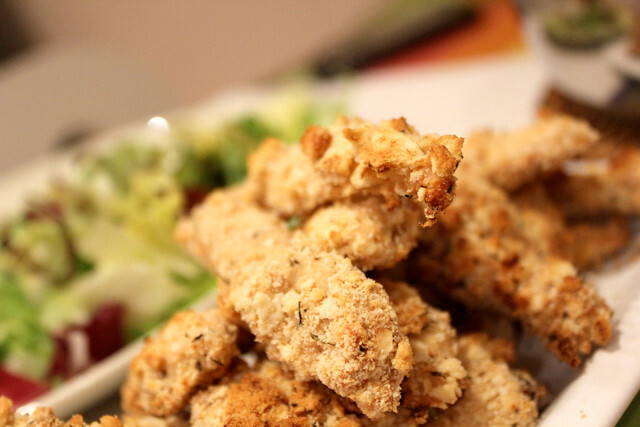 Place the crumbs in a shallow dish and coat each nugget with the crumbs. Lay the coated nuggets in a oven proof tray lined with parchement paper and bake in a 200C oven for about 20 minutes or until golden. Baking is definitely mke these nuggets more healthy and crunchy 🙂 Thanks for the tip! olhando para o teu blog acho que temos gostos muito parecidos 🙂 Uma delicia!!! What a neat recipe and so simple. I've never thought to marinate my chicken in yogurt. I'm going to have to try this out. So I am following you now! Nice to visit Lisbon again. Just love the city. The yogurt marination is great for chicken. Makes it tender and tastier. Wonderful recipe to follow! Thank you for sharing. Cheers! This looks great! I love chicken nuggets but feel guilty eating them too often since they're so unhealthy. I'm saving this to make as a healthier alternative sometime! I've never seen those crackers in the US but they look pretty similar to the Ritz crackers we have.